A low mood will tend to cause a shrinking of activity level. This may start in subtle ways such as skipping exercise, declining an invitation to go out with friends, or not engaging in a hobby. Research has shown that this shrinking of activity level will then tend to cause a further decrease in mood. In general, the fewer things we do. the fewer opportunities there are for positive things to be experienced that might push mood in a positive direction. Now remember that a lowered mood causes a shrinking of activity level which causes a further lowering of mood. This further lowered mood then causes a further shrinking of activity level. What then often evolves over time is a sort of vicious spiral: low mood —-> lowered activity level —> lower mood —-> even lowered activity level —-> even lower mood and so on. People with depression may notice that the range of things they currently do compared to a few months before occupies a much smaller circle. The good new about vicious spirals is that they move in both directions. Therefore, if activity level increases then mood will tend to increase, which will lead to more activity level and further increase in mood. 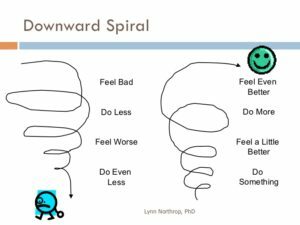 The difficulty is that with depression there is a great deal of behavioral inertia when the spiral approaches the bottom. At that point a person with depression may not feel like doing anything. The key here is “feel” like. We often consult our feelings when deciding what to do. We ask ourselves: “Hmm…I wonder if I feel like going to work out today?” If my feelings are working normally this is a perfectlyreasonable question to ask myself. Most days I might feel like it and occasionally I might not. The problem with depression is that it is a mood disorder. My mood is not operating normally. Anytime I ask my mood about doing something the answer will always be no. I keep waiting until the proper feeling is present, but it never seems to come. There are many activities I might decide to do. One that allows you to see this dynamic clearly is to exercise. Exercise is very beneficial for depression. It does not have to be a 6 mile run. It can be 30 minutes of simple walking. If I walk even though I don’t feel like it, afterwards I will tend to have more motivation for doing other things. Activities don’t have to be big deal or glamorous. Simple pleasures like a walk in nature, playing with a pet, sitting in a park will do. Engaging in a hobby that you have not done in a while is also good. Tasks that give a sense of accomplishment like making a meal, gardening, or finishing that small project that you have been avoiding can be good. A trick that helps with depression is to do activity scheduling. Instead of relying on fluctuations in mood to dictate what you do, take a sample of activities like those above and schedule them at various times during the week. You might schedule things like walking at a specific time each day; the same with practice guitar or watch a movie. You might schedule lunch with a friend you haven’t seen in a while. Think about activities that were normal for you to do at a time when you were not struggling with depression and put them on the schedule. After you have your schedule, instead of asking whether you are in the mood or not (of course you’re not you have depression) you ask yourself “What time is it?” then do whatever is on the schedule in spite of the mood of the moment. This is how we apply the “Do First, Let the Feeling Catch Up” principle. When you get the hang of activity scheduling you will be on your way to turning the spiral around and overcoming part of the inertia that keeps us trapped in depression.